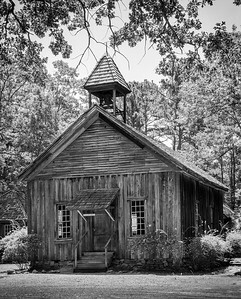 This Americana gallery is a collection of my literal and interpretive images of buildings, artifacts and other items that are a part of the geography, cultural heritage, folklore, and history of the United States. In these photographs I hope to visually preserve a bit of the history of the United States, especially because some of the subjects of these photographs already no longer exist, and others may soon vanish from the scene. 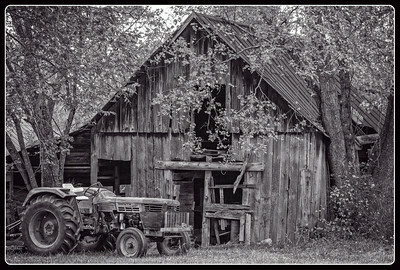 These monochrome images (black & white and variations) were done in the tradition of the early masters of photography, such as Ansel Adams, Edward Weston and Alfred Stieglitz. Many of the images shown here were originally made using the same traditional types of photo equipment and methods, such as with large format cameras, hand developing in trays, and hand printing each print individually. Those earlier images, as presented here, were later digitally scanned, using high resolution scanners, and digitally processed using state-of-the-art computer software, such as Photoshop and Lightroom. More recent image exposures were made using modern digital cameras. I still have a love for monochrome as I feel that it is truly an expressive and creative fine art medium. Even today, with all the modern tools and processes available, I often visualize a scene in monochrome, and make the exposure and process the image accordingly. 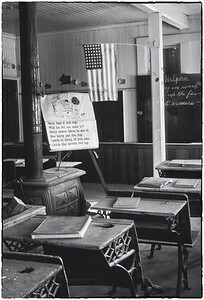 I recommend that you also view the “Americana in Color” gallery for a full range of different photographs in full color. 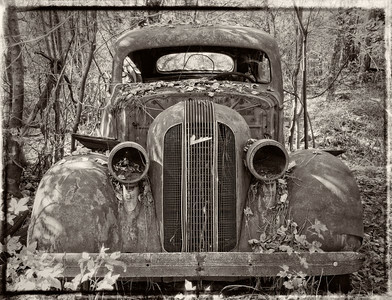 "Pontiac Lost in the Woods"
A vintage Pontiac, long abandoned in the woods. 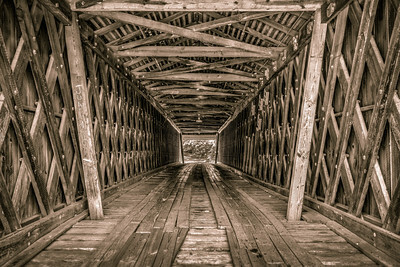 The Euharlee covered, bridge near Cartersville, Georgia, is listed in the National Register of Historic Places. 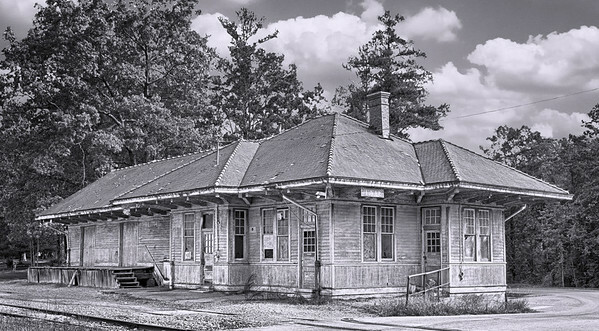 The historic Tate Train Depot, built in 1916 in Tate, Georgia. 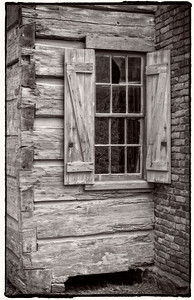 A pioneer log cabin window, adjacent to the fireplace chimney in Pine Mountain, Georgia. 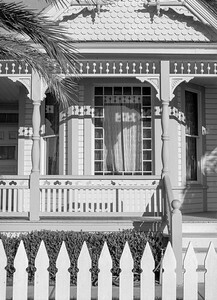 Heritage House, as it is now known, is an Eastlake-style cottage, was built by Dr. George Crook Clark, in 1894, and served as both his home and office in Fullerton, California. 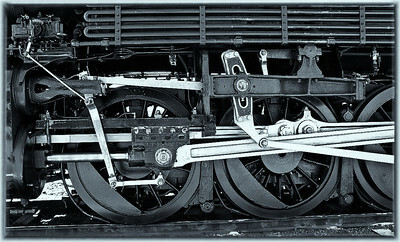 Break Wheel on a caboose at the Orange Empire Railway Museum at Perris, California. 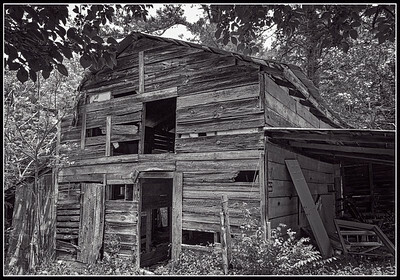 A ramshackle barn in Acworth, Georgia. 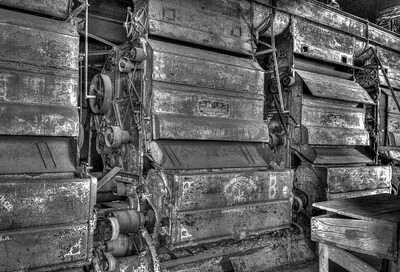 Cotton gin machines in an abandoned cotton mill in Taylorsville, Georgia. 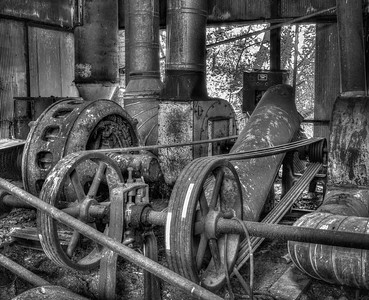 The motor and drive wheel room of an abandoned cotton mill in Taylorsville, Georgia. 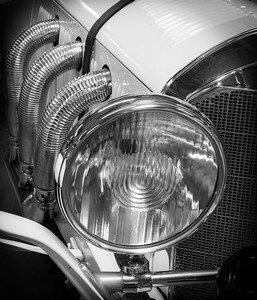 Headlight, manifold and grill detail of a 1930 Duesenberg automobile. 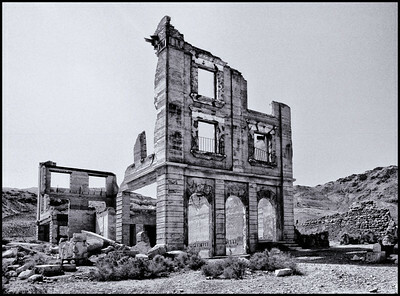 The remains of the Cook Bank Building in Rhyolite (Ghost Town), Nevada. 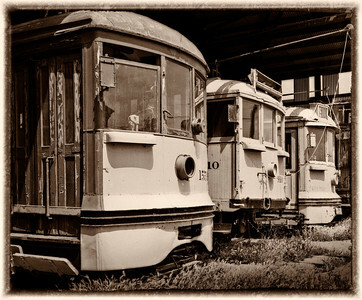 Retired streetcars in the Car Barn at the Orange Empire Railway Museum in Perris, California. 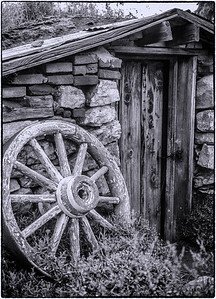 "Abandoned in Holly Springs #3"
An abandoned barn in Holly Springs, Georgia. 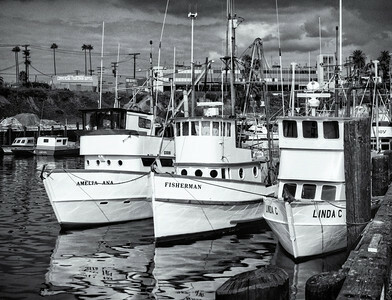 Fishing Fleet in the LA Harbor, Los Angeles, California. 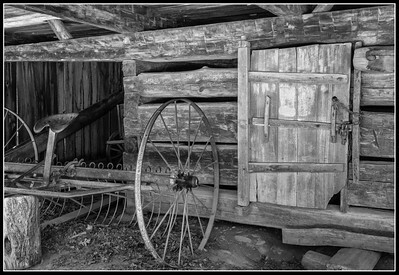 "Hay Rake & Corn Crib"
A long retired hay rake sits idle, next to a corn crib, under a cantilevered barn in the settlement of Cades Cove in Tennessee. 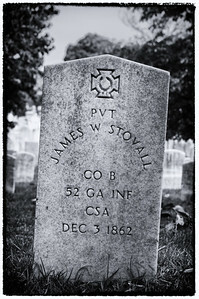 Cades Cove is now a part of the Great Smoky Mountains National Park. 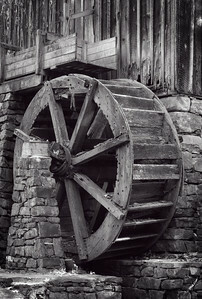 No water flows over this long abandoned grist mill wheel, and the milling process long ago ceased. 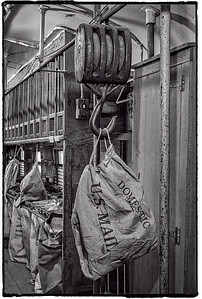 Mail bags and Block & Tackle on a retired Railway Post Office (RPO) car. 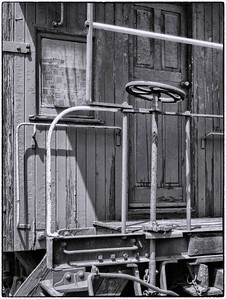 The RPO, also known as a mail car, was a railroad car used as a means to sort mail en route, in order to speed delivery. RPOs were used from the mid 1800s into the mid 1900s. 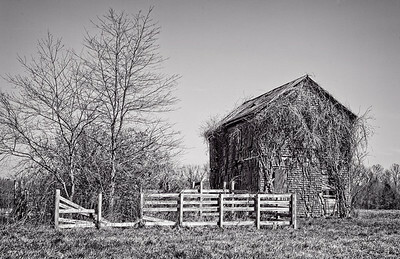 "Little Building on the Prairie"